SACRAMENTO, Calif. (AP) - California Gov. 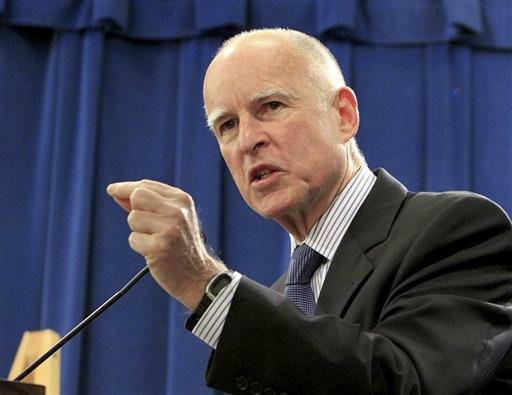 Jerry Brown announced Wednesday he is dropping a plan hatched by former Gov. Arnold Schwarzenegger to sell 24 state government buildings to private investors because the high cost of rent did not make sense for taxpayers. The state had been in negotiations to sell the properties for $2.3 billion and use the proceeds after paying off construction bonds to help close the state's general fund budget deficit. Under a deal approved by lawmakers, the state would have continued using the space by entering into a 20-year lease with the new owners. The Associated Press reported in April that the deal would end up costing the state $5.2 billion in rent over 20 years, likely saddling taxpayers with costs beyond whatever the state would net from the sale. That assessment was confirmed by the nonpartisan Legislative Analyst's Office, which found the sale shifts taxpayer costs to the future. The state controller and treasurer also opposed the sale. "No doubt there's a huge budget deficit and the Legislature and the governor tried to do everything they could, but it's still very daunting," Brown said Wednesday. "The sale of the buildings really didn't really make much sense. It didn't make much sense because it in effect is a gigantic loan with interest payments." Brown said selling and renting back the space amounted to a 10 percent loan and that the sale would have been "the ultimate in kicking the can down the road." The AP also reported in April that the Schwarzenegger administration quietly removed appointees from two oversight bodies that must sign off on the sale, replacing critics of the move with people who support it. The move was made as the state began taking bids on the properties, quashing any dissent or independent financial studies that might have emerged as the sale moved forward. Properties that were put up for sale included the Ronald Reagan office building in downtown Los Angeles, the San Francisco Civic Center, which houses the state Supreme Court, and buildings in downtown Sacramento that house the attorney general's office and state Department of Education. Cancelling the sale means Brown will have to cover a $1.2 billion gap that was expected to be filled by the sale's proceeds. His administration is proposing taking out short-term loans from special funds for less than a 1 percent interest rate - a "fraction of the cost," Brown said. He estimated his plan to borrow from Medi-Cal, prison construction bonds and other state resources would be paid back over three years at a cost of about $18 million. Such a maneuver would save the state $6 billion over 35 years compared with Schwarzenegger's proposal, Brown said. The governor added he expected to be able to pull out of the sale without a legal fight. Administration officials said state programs would not be hurt by the alternative borrowing plan. Brown previously had not commented on the proposal. But as attorney general, he declined to represent Schwarzenegger in a lawsuit seeking to block the sale. Three former state building authority members had sued to stop the sale, saying it amounted to an unlawful gift of public funds and illegally bypassed the state Judicial Council, which has authority over some of the buildings that Schwarzenegger wanted to sell. Plaintiffs Jerry Epstein, A. Redmond Doms and Don Casper were ousted by Schwarzenegger's administration for questioning the sale. The sale was set to close Dec. 15 but the state appeals court temporarily blocked it until Schwarzenegger left office, leaving the decision to Brown. "We are thrilled with the decision. It's exactly what we were trying to accomplish through the litigation, and we're pleased we were able to provide the opportunity for Gov. Brown to review the transaction," said Anne Marie Murphy, an attorney representing the plaintiffs. The state had awarded the sale of the buildings to California First LLC, a consortium of investors led by a Texas real estate firm and a private equity firm based in Irvine. "We are disappointed with Gov. Brown's decision not to proceed with the state office building sale," said Michael Bustamante, spokesman for California First. "We had looked forward to assisting the state in addressing its fiscal crises and are available if our assistance is needed in the future."